oe: Italian Bee Gees, but fall in disco fever more nicely. Like I Nomadi, even Pooh are a marginal inclusion here, name them to an italian prog fan and you'll probably cause strange visual expressions. Anyway, they're highly regarded by some foreign collectors, especially from Japan and Korea, and smart dealers often describe their albums as "prog classics". 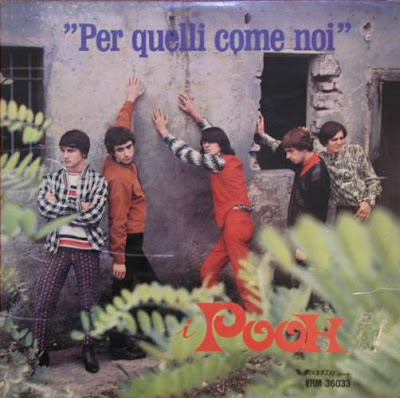 Another beat band, I Pooh started in 1964 in Bologna with an early repertoire, as common to many beat groups of that time, mainly based on italian-sung covers of english and american hits. Their first LP, Per quelli come noi, is an enjoyable beat classic, with covers of songs by the Who, the Kinks, Spencer Davis Group, along with original material. Two later albums went in a more melodic pop direction, and at the turn of the 70's, with a line-up and record company change the band took their typical pomp pop style. In 1973 one of the founder members, Riccardo Fogli, left for a successful career and was replaced by former Capsicum Red guitarist Red Canzian, now on bass. The stable line-up lasts today, and Pooh are still in the 2000's one of the main live attractions in Italy with a long series of gold albums. In the 70's production, prog fans can find something interesting in Parsifal and Un po' del nostro tempo migliore, but the multivocal falsetto parts and orchestral arrangements will sound disturbing to many.